George Graham Reviews June Tabor's "Rosa Mundi"
Britain has given us some outstanding women vocalists, especially from the English folk scene that arose in the 1960s, including the late Sandy Denny of Fairport Convention, Jacqui McShee of the Pentangle, Maddy Prior of Steeleye Span, Linda Thompson, Norma Watterson, and June Tabor. Each has a distinctive sound, yet each shares a kind similarity, a cool, relatively un-ornamented style that can often convey much emotion very subtly. With the exception of Ms. McShee the rest since in an alto range, rather than a high soprano, and have a kind of dusky quality that seems to echo across the ages from the time of some of the very old folk songs of the British Isles. Ms. Tabor has just released a new CD called Rosa Mundi, it turns out to be a interesting concept album, a form that is not unfamiliar to the scene. With an academic background graduating from Oxford and with careers as a librarian and restauranteur, June Tabor came to folksinging at first in the American style popularized in the 1960s, but while on campus associated with a group that worked in a more unadorned sound, mostly free of vibrato. She came to the attention of many American fans of English folk through a joint CD she did in the 1970s with Maddy Prior called Silly Sisters, and over the years has made recordings with the Oysterband, guitarist Martin Simpson and harpist Savorna Stevenson. But her most striking recordings have been her own, most done with the accompaniment of Huw Warren, a pianist with a jazz background. Over the past 30 years, Ms. Tabor has become one of the most acclaimed voclaists in the genre, attracting many other artists as fans. Elvis Costello wrote her a song, and many other prominent performers have sung her praises. Ms. Tabor's recorded output has been both eclectic and subtle. Not a much of a songwriter herself, she easily goes back and forth between ancient traditional music and contemporary songs written by rock artists, including the Velvet Underground. She has also had an affinity to jazz, thanks in part of Warren's influence. In the early 1990s, Ms. Tabor did an album of jazz standards called Some Other Time, and her last CD, A Quiet Eye released at the beginning of 2000, had guest appearances by members of the British group The Creative Jazz Orchestra. Hew new CD has a more intimate supporting cast, just pianist Warren, violinist Mark Emerson, who has also worked with Ms. Tabor in the past, plus cellist Richard Bolton. The title of the CD Rosa Mundi is a reference to a species of rose, and all the songs on the album are related the rose, a flower for which Ms. Tabor, as an avid gardener, has a special attachment. Normally, I tend to be wary of concept albums with all the songs relating to a single topic, especially from someone who is a song interpreter rather than a songwriter. The thread can sometimes be a little tenuous, or the song choice a little lame. But this CD contains a fascinating mix of songs, some of them traditional, but also drawn from a wide variety of sources including Robert Burns poetry, a World War I ballad, very old songs from the British Isles, a folk song from Kentucky, a couple of children's nursery rhymes and two contemporary compositions, written for the album. They are all given a tasteful treatment, though often with a rather somber mood, even when the lyrics are a bit more upbeat. Listening to the album, one finds it interesting to hear how the rose can become a powerful image, especially in regard to love, or the loss of it. Once again, Ms. Tabor's voice is remarkably powerful in its almost aloof subtlety, as she delivers these songs in the musical setting that has been called "chamber folk," and yet they can leave a lasting impact on the listener. The more obscure songs are engaging to listen to, while Ms. Tabor's interpretations of the more familiar piece can be quite striking. This is not the first time someone in the English folk scene has made a concept album. In the early 1990s, Maddy Prior made a record called Year, consisting of songs about the seasons, and she has included suites of songs on related subjects. 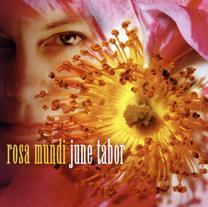 On Rosa Mundi, June Tabor has brought together a surprisingly rich collection of songs about the rose, and creates an album that is both striking in sound and fascinating in subject. Ms. Tabor remains one of the finest voices to come out of the English folk scene, or indeed in almost any style of music. Though not endowed with a particularly wide tonal range, Ms. Tabor more than makes up for it in her remarkable delivery, imparting great power through subtlety, with the piano and string arrangements making for all the more distinctive listening. Our sound quality grade is about a "B." The album was beautifully recorded, with producer John Ravenhall again seeing that the pastel colors of the performance are captured. Ravenhall says that Ms. Tabor likes to record her vocals live with the group, and that adds more to the intimate quality of the CD. Unfortunately, somewhere along the line, probably at the mastering stage, the sound was pumped up with compression that is quite inappropriate for this kind of music. The CD just sounds too loud and that undermines some of the finesse of the performances. In a scene that has given us some great voices, June Tabor is, if you have not heard her before, one you will not soon forget. And for those familiar with her work, this interesting and beautifully performed concept album is one you won't want to miss.